Learn about the most effective methods of water purification for emergencies so you are prepared ahead if the need arises. Purification methods rid water of harmful bacteria and other microorganisms that can make you sick. Depending on the appearance of the polluted water, you may need to pre-treat it to remove particles and debris before disinfection. Water purification methods are easy to use to provide a quick supply of clean water in an emergency. They decrease the risk of waterborne diseases by organisms such as E. coli, Salmonella, Giardia lambda, and Cryptosporidium. Centers for Disease Control and Prevention (CDC) notes boiling is the most effective method to purify polluted water, but other methods are not as effective in removing all contaminants. If you can't boil your water, consider combining two methods, such as filtration and chemical disinfection, for better results. Pour your water through a clean handkerchief, other clean cloth, T-shirt, coffee filter, or paper towel into a clean container until you are ready to disinfect. 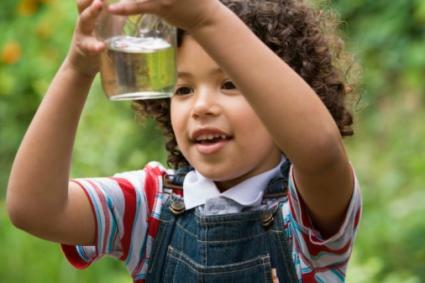 Run the polluted water through a store-bought or homemade filter to trap contaminants. Let the water sit for 30 minutes or more to settle particles to the bottom of the container. 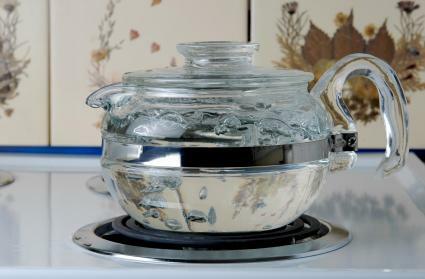 Pour off the clearer water from the top into a clean container and cover. Continue boiling for at least one minute. Let it cool and store the water in a closed clean container. Rapidly stir the water for a few minutes after you boil it. After the water cools, shake it vigorously in a closed container. Pour it back and forth from one container to another. Store the boiled water at least half an hour before drinking. If you don't have a source to boil water, sunlight might be your next best friend. Sunlight destroys microorganisms in water through is UV radiation and heating, according to WHO. To do this, expose a see-through plastic bottle filled with water to direct sunlight for five hours. If the temperature is high, you can disinfect a bottle of water in one hour. If it is a completely cloudy day, your water needs about two days of exposure to purify. Iodine and chlorine-based chemicals are effective in killing viruses and bacteria, but not all parasites, according to the CDC. Chemical disinfection inactivates microorganisms by penetrating their cell walls to clean contaminated water in about 30 minutes. You will notice the treated water has a chemical taste to it. Note that WHO recommends you drink chemically treated water only during emergencies and not for regular use. Water purification tablets are a convenient, low cost way to treat polluted water with chemicals. You can disinfect a quart or gallon of water for personal use, or treat a big container to serve a your family. The tablets are low-cost, and they are easy to store and use during emergencies, travel, camping, boating, and short-term need. Potable Aqua Water Treatment Tablets sell on Amazon for $7 for 50 tablets per bottle. It takes two tablets to purify a quart of water. The active ingredient, Tetraglycine Hydroperiodide, generates iodine as the purifying agent once the tablet dissolves. An unopened bottle of tablets is good for four years, and an open bottle lasts one year. The tablets kill Giardia but not Cryptosporidium. 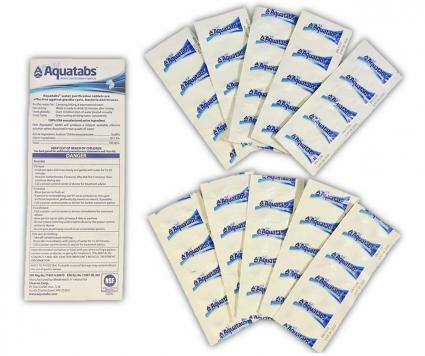 Aquatabs effervescent tablets are available for $14 for 100 tablets per box on Amazon. The active ingredient is sodium dichloroisocyanurate (NaDCC), which releases chlorine as the purifying chemical. One tablet treats two quarts of water. They have a shelf life of five years if the packet is unopened, or one year if it's opened. Pre-treat the water to remove particles and other debris. Add the recommended number of tablets for the quantity of water. Stir for a few minutes until the tablets dissolve and cover the container. Let the water sit for the required time (usually 30 minutes), and it's ready to drink. Household bleach disinfects water through chlorine and is an easy, inexpensive water purification method. Bleach will kill viruses and bacteria but not parasites, such as Giardia lambda or Cryptosporidium, according to the WHO and EPA. To disinfect water use a plain, unscented, uncolored, liquid household bleach containing five to six percent sodium hypochlorite, which will generate chlorine in the water. The Red Cross advises adding eight drops of bleach per two-liter bottle of water, or sixteen drops per gallon. Water filtration methods remove particles and microorganisms by forcing water through layers of filter material, which trap the contaminants. They are effective in removing parasites and some bacteria but not viruses. According to the CDC, some types of filters do not remove cryptosporidium, but those labeled "reverse osmosis" with a small filter pore size of a micron or less will do so. Filtration systems use ceramic, activated carbon or charcoal, or other materials or technology to filter water. Ceramic filtration removes particles, and the addition of silver purifies the water. For further purification, treat the filtered water with chemical tablets. Alternatively, you can boil the water or let it sit for 48 hours. The gravity flow Katadyn TRK Drip Gravidyn Water Filter sells on Amazon for $184. The 10 liter drum holds three combined ceramic and activated carbon filters impregnated with silver and can purify enough water for six people. To use the filter, follow the directions that come with the product. The Outback Mini 4-Stage Gravity Powered Water Filtration System is a two-bucket configuration that works using gravity. The system costs $125 at ESP Water Products. It removes particles, bacteria, viruses, and some chemicals from contaminated water. It can filter enough water daily for a family of four. The Sawyer Mini Water Filtration System sells for about $20 at Walmart. This small, portable system uses filtration technology found in kidney dialysis. The two-ounce kit filters 100,000 gallons of water with a small filter, a water pouch, and a straw. The filter fits the neck of a standard water bottle. 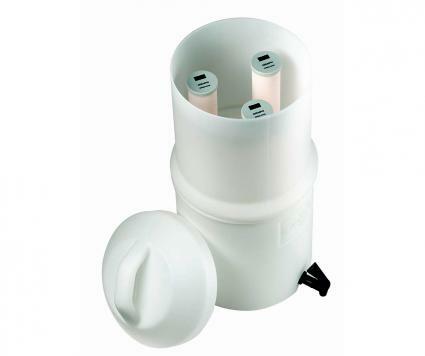 The Do it Yourself Emergency Water Filter Kit contains all you need build your own water filtration system. The kits sell for $27 on SHTFandGO.com and comes with complete instructions. Be prepared during an emergency to purify your water if your supply is contaminated. Make sure you organize your water treatment supplies at home as part of your emergency preparations.